Company A of the 12th Wisconsin Infantry has been home to Prescott on furlough. Edwin Levings has gone to Madison in preparation for the regiment leaving Wisconsin to go back to the War. 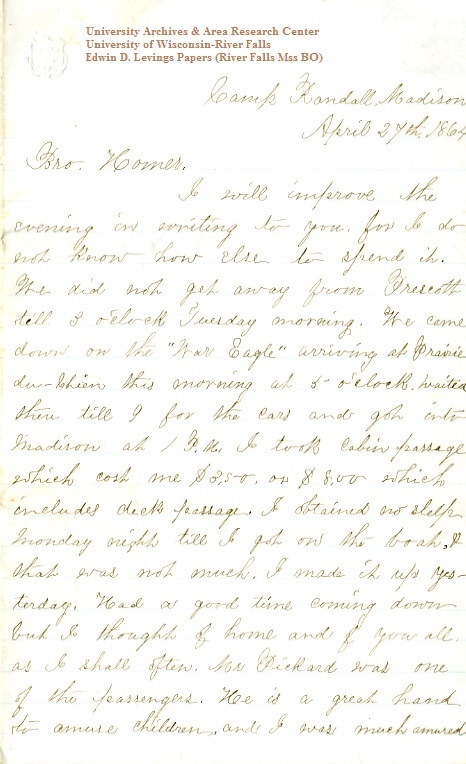 Ed writes to his brother Homer, who is lingering at Prescott because of illness. I will improve the evening in writing to you. For I do not know how else to spend it. We did not get away from Prescott till 3 o’clock Tuesday morning. We came down on the “War Eagle” arriving at Prairie-du-Chien this morning at 5 o’clock, waited there till 9 for the cars and got into Madison at 1 P. M. I took cabin passage which cost me $3.50, or $8.00 which includes deck passage. I obtained no sleep Monday night till I got on the boat, & that was not much. I made it up yesterday. We had a good time coming down but I thought of home and of you all as I shall often. Mr. Pickard was one of the passengers. He is a great hand to amuse children, and I was much amused myself to witness his performance with them. I took supper at Henry Stone’s house Monday and had a good visit. Mr. Miller who preached at River Falls last Sabbath was there and I formed his acquaintance—found him a very interesting man. I took along the box sent to George Miles—left it at the depot with the Capt.’s baggage. The Capt. left you transportation at his house. If you prefer you can get cabin passage by paying $3 or $4. The Capt. said he would try and get you transportation from Pr. du C. [Prairie du Chien] but I do not know whether he did or not. Apply at the ticket office for it anyway, for possibly he made arrangements for you. I inclose [sic] you a ticket which the Capt. gave me for you. Had I known the Capt. would have left transportation behind I should not have left home till to-day, for we are not obliged to be here till Friday night. The 37th leaves here for Annapolis to-morrow. Ellsworth [Ed’s cousin Ellsworth Burnett] put on his captain uniform this morning—have not seen him yet. Justin Winchester is coming down with the measles—guess he will not go with the regiment. I hope you are getting better and will join us ere a great while but stay till you are thouroughly [sic] well and have a good visit; and if you are able, write write to me, for I shall be lonesome without you and letters will be a great treat, but I must stop. Direct to Camp Randall as letters will follow if we are not here to get them. Hoping you are all well tonight and with much love to you all. I bid you good night. There is talk of our going away Saturday, but the [___] is Monday will be the day. 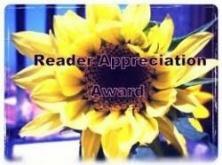 I will write before starting & let you know where our destination is & send photos. Edwin. Thursday morning — I have seen Ellsworth this morning. He is not very well. He is not yet released from recruiting, he says & will probably go up to Pierce Co. again for more recruits before going to Annapolis. Justin will be left behind. Walter Howes is their Orderly Sergt. I must go up town to-day & get those pictures so I will not write more.